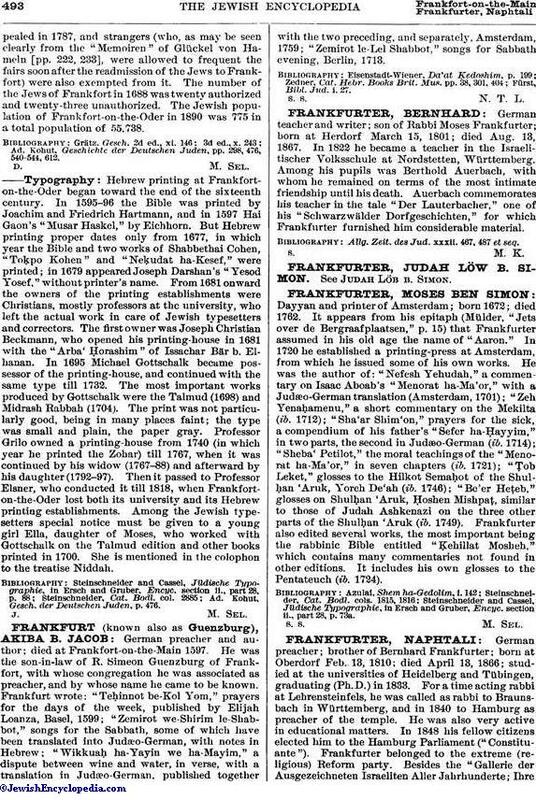 German teacher and writer; son of Rabbi Moses Frankfurter; born at Herdorf March 15, 1801; died Aug. 13, 1867. In 1822 he became a teacher in the Israelitischer Volksschule at Nordstetten, Württemberg. Among his pupils was Berthold Auerbach, with whom he remained on terms of the most intimate friendship until his death. Auerbach commemorates his teacher in the tale "Der Lauterbacher," one of his "Schwarzwälder Dorfgeschichten," for which Frankfurter furnished him considerable material. Allg. Zeit. des Jud. xxxii. 467, 487 et seq.